With the abundance of fruit and vegetables available everywhere, summer is the perfect time to feast on fresh, easy to prepare salads. 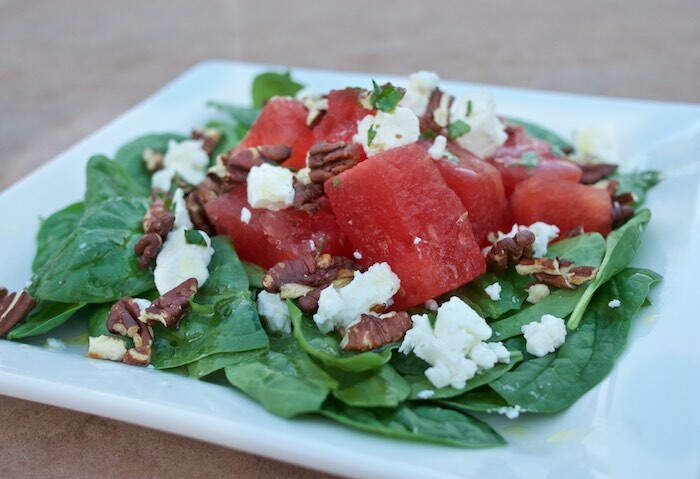 This quintessential summer recipe mixes the sweet flavor of watermelon with savory feta and pecans giving you a fun healthy dish everyone will love. Whisk oil & lime juice until it begins to emulsify. Add pecans and mint, stir to combine. Season with salt & pepper to taste. In a large bowl mix spinach with watermelon and feta cheese. Toss with Pecan Lime Vinaigrette and serve. This sounds so good! I love watermelon in salads! You had me at pecans. I love watermelon in a salad! So glad to know I'm not weird for liking watermelon in salads. I just love this flavour combo! This looks so fresh and yummy! I have been looking for a good watermelon salad recipe. This looks perfect to try! I love the combination of watermelon and feta, sounds so amazing! I really need to try this. Sounds like a fresh and delicious salad! The thought of the fresh mint and watermelon with feta sounds awesome. Feta and watermelon is such a perfect pairing! This is definitely my kind of salad! OMG, this is too funny to see this post now as I literally had a massive watermelon sitting on my front doorstep this morning!! Is this a sign? :) Such a healthy combo! That a perfect salad! Such a light tasty meal! Love it! This sounds absolutely amazing! What a great summer salad! I LOVE watermelon so this is a must try for me! Love anything with watermelon! So perfect for summer. This is a combo I've never thought of but I love the idea of feta and watermelon! Yummy. What a great combination. I love watermelon salads and to add pecans + greens sounds wonderful. What a gorgeous summer salad! Love the addition of pecans. I literally want to go home and make this for lunch!